The fruit is suitable for human consumption. Several native tribes made it part of a traditional diet. Martin Terry, associate professor of biology at Sul Ross State University, says the tunas are “vaguely sweet,” with a taste similar to the fruit of a prickly pear. “They don’t taste bad, if you’re willing to deal with the spines,” Terry says. Glochids can be scraped off with a knife or burned off with a lighter. Rolling fruits in campfire coals is another way of removing the stickers. But given their small size, dining on tasajillo tunas is a lot of work for little reward. 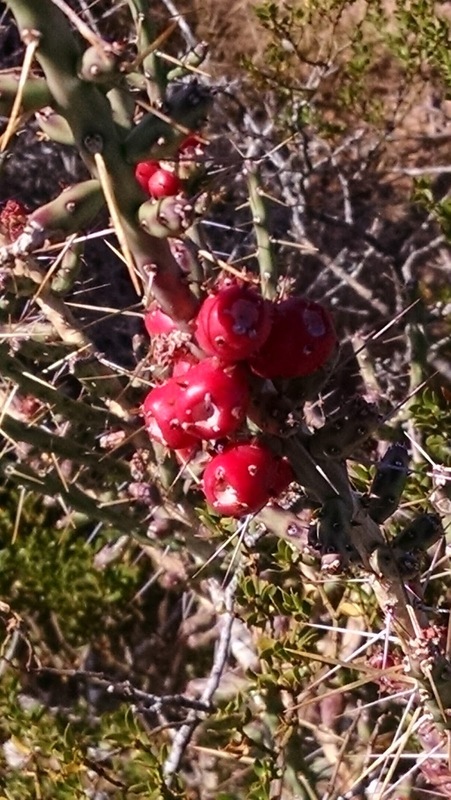 For most of us, it’s best to appreciate this cactus from a distance, admiring the way those red globes brighten the winter landscape. Tasajillo can grow from seed, but it’s more likely to spread by cloning itself. Opuntioid cacti have jointed stems, arranged in segments that can easily detach without damaging the rest of the plant. 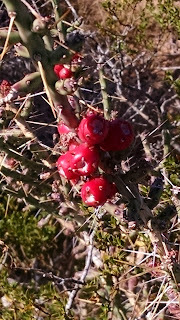 The joints are dotted with areoles, a specialized type of bud that’s peculiar to the cactus family. Spines, flowers and new branches arise from areoles. A stem joint that comes in contact with soil can take root and grow into a whole new plant. So tasajillo’s habit of hitching rides on hikers, bikers, cattle, horses and furry predators is an effective way to increase its numbers. It can take over large areas in grazing lands, where many ranchers consider it a nuisance. These berries do have an intoxicating effect, which varies between different people. I would use caution if you plan on eating these if you are dehydrated or you have a weak immune system. In this case, I would instead use them as bait to catch other game like rabbits or quail. Do your own research prior to eating these fruits.